Will these editorials make a difference? It hasn't even been two years since the editorial board of the Topeka Capital-Journal handed Donald Trump one of his few newspaper endorsements in the run-up to the 2016 election, calling him "the wisest choice to lead our nation going forward." But on Thursday, the paper will publish a very different editorial, as it joins nearly 350 other publications across the country in standing up to Trump's anti-press rhetoric. "It's an acknowledgment that we're part of this community," Capital-Journal publisher Stephen Wade told CNN. "The people who work for me here, my teammates, they live here, they play here. We're just normal people, too. To make us out to be enemies is just not right." Trump has routinely used the phrase "enemies of the people" to rail against the media, calling unfavorable coverage of his administration "fake news." The paper's editorial will zero in on these attacks. "We're sitting here in Topeka, the capital city of Kansas, and we're in the middle of a heated election year," Wade said. "It's one of those deals where if someone doesn't like what's being asked, if they think we're not being favorable to their candidate of choice, then it gets to be very contentious. The cry of of 'fake news' starts to get yelled across the room. It's a difficult environment." Breaking: Close to 350 editorial boards will join @GlobeOpinion in reaffirming our shared commitment to a #FreePress. There weren't many newspapers that endorsed Trump in 2016, and of those that did, the Capital-Journal is one of the few to participate in an initiative that was coordinated by the Boston Globe. Newspapers across the country, including the New York Times, Denver Post, Miami Herald and Philadelphia Inquirer, are running editorials on Thursday to combat Trump's ongoing attacks on the news media. The Globe began contacting newspaper editorial boards last week; within a few days, more than 100 publications had signed on to the effort. Earlier this week, the number swelled to more than 200. As of Wednesday, 350 papers had joined. But the Capital-Journal, one of Kansas' largest papers, stands out. Unlike virtually all the others, it actually backed the man who inspired the editorials. In its endorsement that was published just a few days before the 2016 election, the Capital-Journal editorial board called Trump "a flawed candidate" and expressed hope that "his bullish tendencies [will be] tempered by the perspectives brought by House Speaker Paul Ryan and Vice President Mike Pence." But the endorsement also said that "Americans are thirsting for a fresh voice and hopeful perspective" and that the "outsider -- the business magnate -- offers the United States the optimal chance of rethinking our economy and introducing fresh ideas and fearless leadership." And near the end of the endorsement, the editorial board said the decision was shaped partly by the newspaper's tradition. "Throughout the arduous and bruising primary and general campaigns, Trump has embraced the traditionally conservative tenets championed by The Topeka Capital-Journal's family ownership," the endorsement said. "It is in line with that philosophy we make our stand today." At the time, the Capital-Journal was owned by Morris Communications Co., a Georgia-based media company whose holdings include print publications, outdoor advertising and radio broadcasting. In 2016, all of Morris' daily newspapers endorsed Trump. But last summer, the company sold the assets of Morris Publishing Group, including its daily papers, to GateHouse Media, a company that operates in 37 states, including nine weeklies and 10 daily publications in Kansas. Prior to taking over at the Capital Journal earlier this year, Wade was general manager and president of The Augusta Chronicle in Georgia, another former Morris publication where the company's namesake, William S. Morris III, still serves as publisher. The Chronicle, after not being included on the list of participating newspapers, ultimately did run an editorial published online late Wednesday that called out Trump's repeated cries of "fake news." 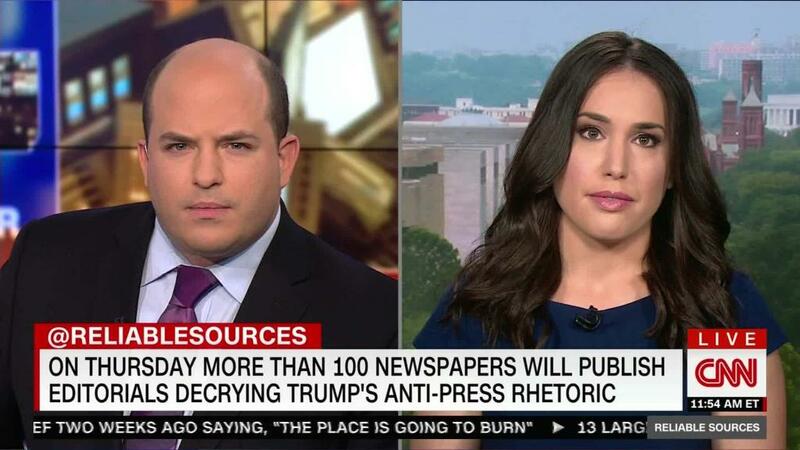 Michael Ryan, the editorial page editor for the Chronicle, told CNN that the paper has "some very vocal Trump supporters among our readership who, even prior to today, have actually been quite unhappy with our criticism of the president." "I didn't plan the editorial far in advance, and we'd upbraided Mr. Trump I think just last week on this topic, but I felt it would bear repeating from a different angle -- that of this country's reliance on a free and independent press -- especially as a newspaper that endorsed him and continues to support his policies but not his rhetoric," Ryan said. Ryan told CNN that he woke up Thursday morning "to very nice plaudits from several prominent Augustans from varying locations on the ideological scale." GateHouse left it up to each of its papers to decide to whether to run an editorial on Thursday, according to Wade. Wade, who also acts as senior group publisher for GateHouse Media Kansas, said all of the dozen or so newspapers he oversees in the state will run editorials. And he insists that the Capital-Journal would do the same, even under the previous regime. "I think we would," Wade said. "The reason why I can say that is that Mr. Morris would still continue to stand behind that endorsement, but that doesn't mean that we're not critical of the president. We're never ever going to be in lockstep with an elected official." "These are tactics that we firmly believe are wrong," he said of Trump's media attacks. "If Mr. Morris was still our owner, I would suspect that we would be running something similar." Trump carried Kansas, a crimson red state that has voted Republican in every presidential election since 1964, with ease in 2016. But the race was much tighter in Shawnee County, home of Topeka, where Trump edged Clinton by only a couple thousand votes. Wade isn't expecting much of a backlash to Thursday's editorial, saying he believes the public views national outlets differently from local publications like his. "My anticipation is that, by and large, the editorial will be well-received here in the community," he said. "I do think there is a perception difference between local news outlets and national outlets. I think in our communities, we're perceived differently."